Hot, hearty, comforting and utterly delicious! Beef Stew for a Crowd is best when made in advance, which is perfect for entertaining! You’ll notice that the above photo of Beef Stew for a Crowd is pretty darn horrible. It’s from 2011 when I originally shared the recipe, and when my blogging skills were relatively new. I plan is to come back soon and update the photos, but not the recipe itself! The recipe itself is a keeper!! 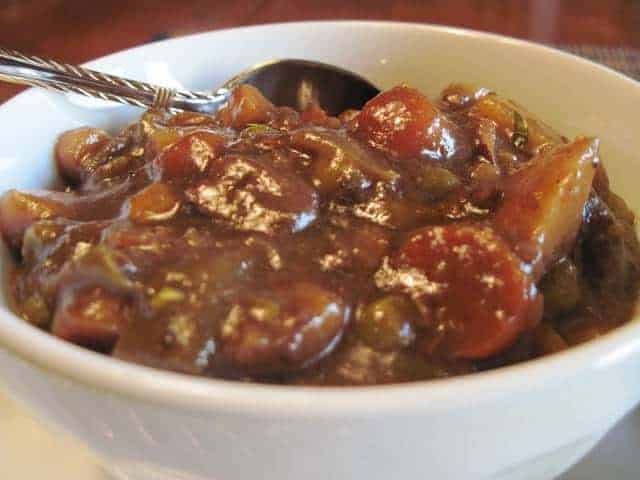 **Please Note – The printable recipe card with detailed instructions, complete ingredient measurements, and nutritional information for making Beef Stew for a Crowd is available near the end of this post. 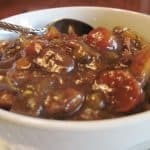 This recipe for Beef Stew for a Crowd is one I think often, but haven’t made in several years because we don’t do all that much “crowd” entertaining. However, now I think I’ll have to plan a party so I can remake this delicious stew and take a few new pics! I’m thinking SUPERBOWL or should I say STEW-PERBOWL?!! LOL. Sorry! I’m pleased and relieved to report that my beef stew was a huge success at the gathering we’d hosted for my husband’s immediate family on new years day. Considering he’s one of 8 children, it’s no small accomplishment to please all of them in one fell swoop. This stew comfortably fed approximately 25 hungry people and won rave reviews from each. It’s important to note that I made this stew a day in advance of the party, so all the flavors had a chance to meld and marry. Then, on the day of the party, it was easy just to pop it in the oven at a low temperature (325-degrees) to heat through, develop the flavors, and tenderize the meat. All that being said, there is one giant pot of beef stew coming your way. I hope you’re hungry!! Make Beef Stew for a Crowd a day in advance for the best flavor. In a large skillet, brown the bacon until just crispy. Place the browned bacon in an extra large pot with a lid. Set aside. In the same skillet, add the bite-sized pieces of beef and brown (in batches). Season with salt and pepper. After the beef is browned, add it to the same large pot with the bacon. Dice the potatoes into bite-sized pieces and stir them into the pot with the browned beef and bacon. Add the beef stock and coffee into the skillet along with the bay leaves, dried herbs, and remaining seasonings. Stir well. Peel and dice the parsnips and carrots into bite-sized pieces and add them to the pot along with the seasoned beef broth and coffee mixture. Cut the frozen Italian green beans into bite-sized pieces and add them to the pot along with the frozen peas, and the cocktail onions and their liquid. Cover the pot and refrigerate for at least 6 hours (recommended, but optional). To cook, preheat the oven to 325-degrees and allow the refrigerated stew to sit on the counter for 30 minutes. 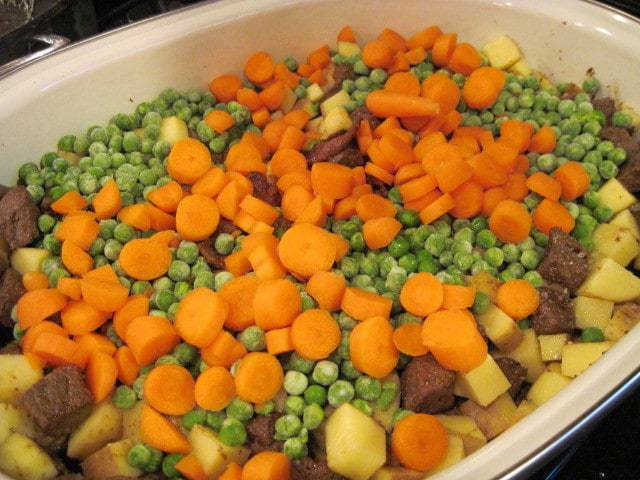 Place the uncovered stew in the oven and cook for 2 hours, uncovered, and two hours covered. Before serving, thicken the gravy by stirring cornstarch into hot water and stir it into the pot along with a little Kitchen Bouquet to deepen the color, if desired. Simmer on the stove top (or return to the oven) stirring occasionally until the sauce thickens. Serves 25-30 very hungry people. Do I have to make this in advance? No, but the flavors will have a chance to marry and improve if allowed to sit in the refrigerator for that extra time together. Plus, if you’re entertaining, having it already made will be one last thing you’ll have to worry about on the day of the party. Will the stew freeze well if I have leftovers? Certainly! I recommend cooking it first and then portioning it out into smaller freezer-safe containers. What if I don’t like parsnips and/or carrots? Do I have to use them? Nope, you can tailor this beef stew to your own tastes and preferences. However, I do recommend (if substituting them) to substitute with other hearty root vegetables that will hold up to the long cooking time, and not fall apart. Might I recommend celery root, turnips, rutabagas? Or, leave the root vegetables out entirely and add more potatoes instead. Below is the printable recipe card for today’s Beef Stew for a Crowd. If you’ve enjoyed this recipe and look forward to making it (or have already made it), I’d appreciate if you’d take a moment to give it some feedback by way of stars near the comment section at the end of this post. Thank you so much! Hot, hearty, comforting and utterly delicious! Beef Stew for a Crowd is best made in advance which is perfect for entertaining! Cut and brown approximately 3/4 lbs. bacon in a large, heavy-duty skillet, over high heat. Place the bacon into a very large covered roaster pan. Working in batches, season the beef with salt and pepper to taste. Brown the beef in the olive oil and bacon drippings remaining in the skillet. Remove the meat with a slotted spoon when browned and add the browned beef to the bacon in the roaster pan. Add the prepared diced potatoes to the beef and bacon in the roaster and stir well to combine. Add the beef stock, brewed coffee, and Worcestershire sauce to the skillet, and bring to a simmer, making sure to scrape up all the browned bits from the bacon and beef found on the bottom of the pan. Stir in the dried herbs, garlic powder, and bay leaves. Add the chopped parsnips, carrots, green beans, peas, and onions with their liquid to the roaster pan and stir well to combine. Season the ingredients in the roaster pan liberally with salt and pepper, remembering there are A LOT of ingredients in there. I'd say at least 1 tablespoon salt and ½ tablespoon pepper. Pour the simmering liquid carefully into the roaster pot and stir well to combine. If needed, add more water to cover the ingredients 3/4's way. Cover the roaster pan and refrigerate at least 6 hours (recommended). 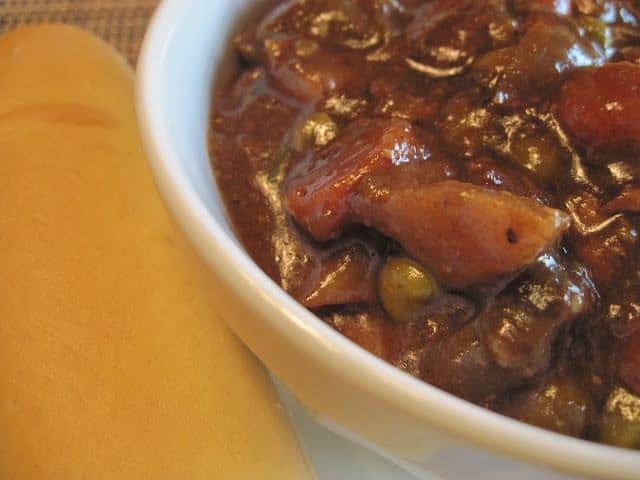 Preheat oven to 325-degrees and allow the chilled stew to sit on the counter for 30 minutes. Add the roaster pot to the oven and cook, uncovered for 2 hours. Remove the lid to the roaster and cook an additional 2 hours in the 325-degree oven. Remove the roaster from the oven. Stir together the cornstarch and 1 cup warm water. Slowly pour the cornstarch mixture into the pan and stir well. Simmer on the stovetop (or place the roaster back in the oven) and stir occasionally until the gravy thickens. Add the Kitchen Bouquet browning sauce if desired. Spoon the stew into bowls and serve with crusty bread. Please season with salt and pepper along the way. I sincerely hope you’ve enjoyed today’s recipe for Beef Stew for a Crowd as much as I’ve enjoyed bringing it to you! Should you have any questions regarding this recipe or anything you’ve seen on my site, please don’t hesitate to contact me directly or leave me a comment in the comment section below. It is always my distinct pleasure to get back to you with a reply just as soon as I possibly can! Wow Renee, that's a big pot of delicious looking stew! I'm sure everyone's tummies were full and smiles were on all their faces. Oh, so comforting and hearty looking! That looks fantastic!!! Great job girl!!! Looks delicious,Renée! That would definitely be a Super Bowl party crowd-pleaser! Stew just seems to be one of those things that pleases everyone. 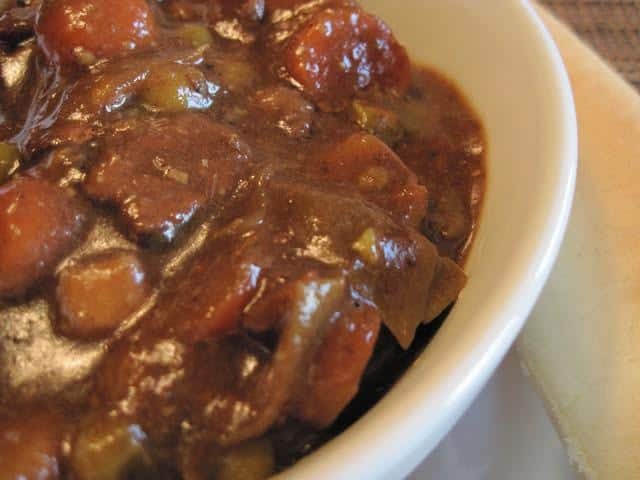 I have made this stew recipe at least four times–for family and for parties. It is my go-to stew. Thanks for a winner! have read stuff from. Many thanks for posting when you’ve got the opportunity, Guess I’ll just bookmark this site. Thank you. I’ll take that as a huge compliment! We served this yesterday afternoon to “feed a crowd” and everyone loved it! The flavor was fantastic! We also enjoyed being able to do all the prep the day before and simply slow-cook in oven the day of our event. The only changes we made to the original recipe were to add mushrooms to the ingredients list and we used a full pound of bacon. Thank you for this recipe! Thank you so much for letting me know this recipe was a success for you! It makes my heart happy to hear it!! I’m glad you also made it your own by tweaking the recipe to suit your tastes. As far as I’m concerned, you can never go wrong with adding more bacon, and I think the mushrooms were a fabulous addition! Thanks again for taking the time to comment! Love it! Have a wonderful day, and stay warm! !